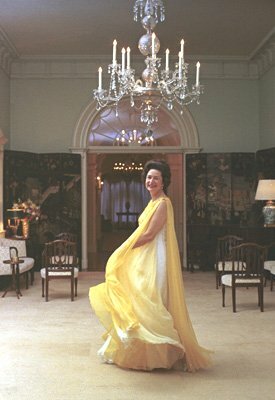 At her funeral service, a family friend said, "Heaven is an even more beautiful place today, because Lady Bird Johnson is there . . . and now there are Texas bluebonnets planted along those streets of gold." Claudia Alta Taylor was born just outside of Karnack, in deep East Texas, on December 22, 1912. Her nursemaid, Alice Tittle, described baby Claudia as "pretty as a lady bird." It wasn't until I read newspaper accounts of Mrs. Johnson's life that I discovered that the nickname "lady bird" actually referred to a type of beetle more commonly known as a ladybug. Mrs. Johnson reportedly hated the nickname, but it stuck. Tragically, five-year-old Claudia lost her mother, Minnie, who died of blood poisoning after a fall. Her two older brothers were away at school, and her father, Thomas Jefferson Taylor, needed help rearing his little girl. Young Claudia's Aunt Effie took charge of her niece. Lady Bird's mother and aunt were both highly educated women for their time, and they passed along their fascination with learning and nature to Lady Bird. She was an excellent student who eventually graduated from the University of Texas at Austin with two Bachelor’s degrees. Her education could have led her down many pathways, but she longed for a little adventure. She got that – and more – when she married Lyndon Baines Johnson in 1934 after a whirlwind courtship. The new Mrs. Johnson supported her husband throughout his political career, while becoming a proud mother to two daughters, Lynda Bird and Luci Baines. Following the assassination of President Kennedy, she and Vice President Johnson became the new President and First Lady of the United States. She carved out her own role as First Lady by promoting causes close to her heart, such as the beautification of America, and the Head Start program. Thanks to Lady Bird's efforts, roadsides across the country came alive with beautiful wildflowers. A wildflower research center in her beloved Austin, Texas bears her name. A nature-lover from earliest childhood, she loved to see people enjoying the outdoors. She was the force behind the creation of Austin's Hike and Bike Trail on the banks of Town Lake, just south of downtown Austin, which was recently renamed Lady Bird Lake in her honor. After leaving office, the Johnsons retired to the LBJ Ranch in the Hill Country, west of Austin. Lyndon Baines Johnson, the 36th President, died on January 22, 1973. Lady Bird filled the following years with her interests, which included her two daughters, seven grandchildren, and 10 great-grandchildren. She died on July 11, 2007 and was laid to rest in the Johnson family plot in Stonewall, Texas next to her beloved Lyndon. Here are some Johnson family recipes – several with Lady Bird's comments. Mrs. Johnson called these "a ranch staple which are served on all occasions: with salads, cocktails, or just when one of the grandchildren gets the munchies!" Cut butter into flour using two knives, scissor-fashion, or use pastry blender. Add cheese and seasonings. Fold in cereal. Drop by small rounds in ungreased cookie sheet and flatten with a spoon. Bake at 350°F for about 15 minutes. Don't allow wafers to get too brown. Makes approximately 5 dozen. Wash and dry squash. Cut crosswise into 1/4-inch slices. Thoroughly rinse shrimp under cold water. Drain. Heat the two tablespoons butter in a saucepan. Blend in flour, salt, and pepper. Cook until it bubbles. Remove from heat and gradually add chicken broth, stirring constantly. Bring to boil for 1 or 2 minutes. Blend in whipping cream and minced onion. Mix in the raw shrimp. Place a layer of squash in the bottom of a 1-1/2 quart casserole and spoon half of the shrimp sauce over the squash. Repeat layers with remaining squash and shrimp sauce. Cover tightly and set in a 400°F oven for 30 minutes. Meanwhile, toss crumbs and Parmesan cheese with melted butter. After 30 minutes, remove casserole from oven and reduce heat to 350°F. Remove cover and top with the crumb mixture. Return to the oven for 15 minutes, or until crumbs are golden brown. Mrs. Johnson wrote: "Lace cookies are served alone or with fresh peach ice cream at the ranch. They're also perfect for that special tea or brunch." Mix flour with the shredded coconut. Set aside. In a bowl, mix Karo syrup, sugar, and margarine until well blended. Put Karo mixture in a saucepan and cook over medium heat, stirring constantly. Remove from heat and stir in vanilla extract. Gradually blend in flour mixture. Drop by teaspoonfuls 3 to 4 inches apart on ungreased cookie sheets. Bake at 325°F until brown around the edges (approximately 15 to 20 minutes). Makes 2 dozen. Beat eggs in a heavy saucepan until thick. Gradually add sugar, beating well. Add milk and whipping cream. Mix well. Bring to a boil, stirring constantly. Reduce heat to low. Continue cooking and stirring until mixture thickens and coats a metal spoon. Let cool. Stir in peaches and pour into freezer can of a 1-gallon ice cream freezer. Freeze according to manufacturer's instructions. Makes 1 gallon. This remarkable woman made our world a more beautiful place. If you'd like to pay tribute to her, carry on her work by planting some of your area's native wildflowers. Lady Bird would love that.